I like to get out on a SOTA summit at least twice a month and Sunday looked like a good day to go out. I checked out the upcoming SOTA alerts looking for summits about to be activated that I had not been to. 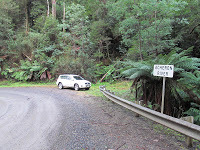 I found Allen, VK3HRA, was heading to Mt Ritchie, VK3/VC-003, on Sunday. A couple of emails later and I’d arranged to meet Allen at the base of the summit at 10:00 am on Sunday. I arrived about 9:35 and Allen arrived a couple of minutes later. 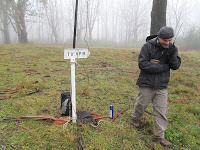 After the expected greetings for two blokes who had been taking over the radio for three years but never previously met, we got our gear ready and started off over the gate at about 9:55 am. The walk to the top is along a forest management track with some parts steeper than others. From gate to summit took about one hour and 45 minutes. Allen was first on air with his inverted vee on 40 metres working the waiting masses. I was a bit slower getting the rope for my antenna over a tree branch and the antenna up and got on air just after midday. I started calling on 12 metres but after 15 minutes of trying I gave it away and moved to 20 metres. On 20 metres I got one QSO into New Zealand and, despite lots of calling, nothing else. 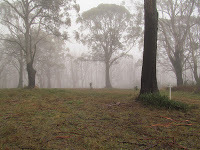 Once Allen was done on 40 metres I moved there and worked eight stations in about 10 minutes followed by 3 QSOs on 12 metres including summit to summit with Glenn, VK3YY, over on Mt St Leonard, VK3/VC-006. Having been on the hill just over an hour, and with the temperature at about 3 degrees, we packed up and headed down to the cars. Another great day on a hill with 13 QSOs in my log and a 16 QSOs in Allen’s log. On the way home I stopped at Acheron Gap and worked Ron, VK3AFW, on the curiously named ‘Near Sundial Peak’ VK3/VW-009. P.S Allen’s blog posting for this activation can be found here.